Nasha Torrez, Dean of Students at the University of NM will deliver this year’s commencement address. 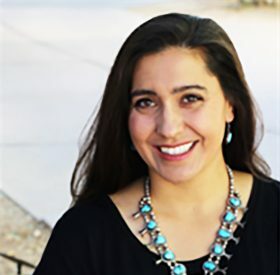 Mesalands Community College is pleased to announce that Nasha Torrez, Dean of Students for the University of New Mexico (UNM) in Albuquerque, NM, will deliver this year’s commencement address. Torrez will be addressing over 80 Mesalands graduates this year, including 10 dual enrollment students from Tucumcari High School. Torrez is a native of northern New Mexico. In 2000, she earned her Bachelor’s of Business Administration, specializing in Human Resource Management Degree from the Anderson School of Management at UNM. Upon graduation, she relocated to southern California and spent the next three years working as an advocate for students with disabilities at a national non-profit agency, that provides legal assistance to people with disabilities. Torrez also assisted Spanish speaking, Native American and rural communities, as they fought for full integration and inclusion, as well as mental health and support services. Three years later, Torrez returned to New Mexico. In 2006, she obtained her Juris Doctorate (J.D.) Degree from the School of Law at UNM. She then served as an Assistant General Counsel to the Governor, where she took a role in intergovernmental management, legal compliance, and policy. In 2008, the Governor appointed Torrez to serve as the General Counsel of Expo New Mexico, where she became the youngest general counsel in the state. In 2009, Torrez decided to leave government service and began working in private practice, representing school districts across New Mexico. In 2013, she joined the in-house counsel for UNM. During her ten years of practice, specializing in education law, she gained experience in student issues such as: grievances, academic appeals, due process, freedom of expression, student confidentiality, behavioral intervention, Title IX, and disability rights. She also has an extensive background in conflict resolution, mediation, and negotiations. Currently, as the Dean of Students, Torrez is instrumental in continuing to create a safer campus at UNM. She oversees the LoboRESPECT Advocacy Center and the Women’s Resource Center, which are confidential reporting sites at UNM for matters related to sexual misconduct. Outside of the office, Torrez enjoys spending time with her husband, their two children, and their dog, Chaco. Mesalands Community College will have their commencement ceremony on Friday, May 11, 2018 at 6 pm at the Tucumcari High School Auditorium.